Home > I o T > Is IoT the next standards battleground? In previous blog posts about future proofing an IoT deployment, the top 2 takeaways from discussions at the Industry of Things event in San Diego were covered. Guest blog written by Tom Gibbings. 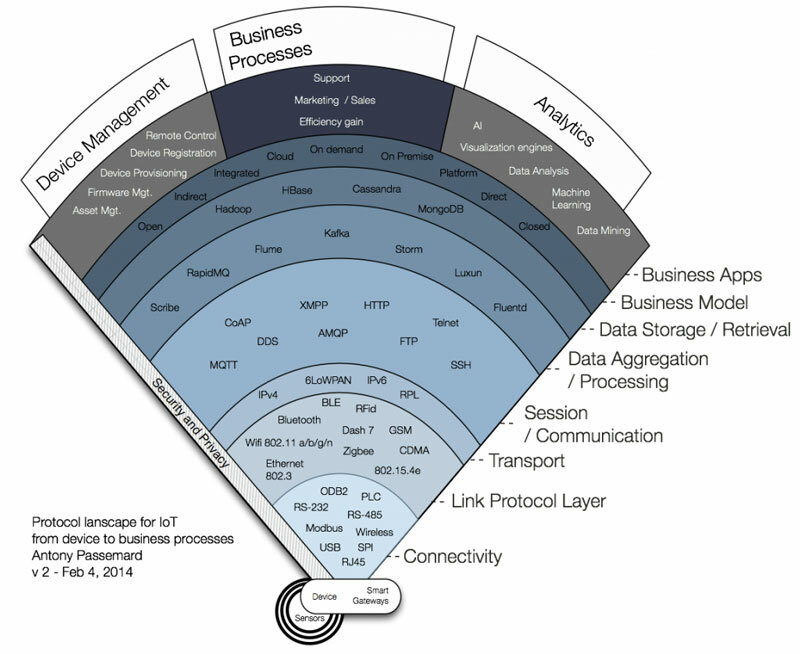 When first venturing into the IoT space in 2014, the following chart was introduced to us and left an impact on a lot of people. The takeaway here is that the IoT technology stack is enormous and the supporting protocols are vast. The noteworthy thing about this chart isn’t the number of technologies included. What is noteworthy is what isn’t in this chart. Specifically, LWM2M and OPC-UA aren’t included. This is a proof-point that IoT is evolving so rapidly that some of today’s frontrunners in the IoT protocol debate weren’t even part of the discussion four years ago. It will be interesting to revisit this blog four years from now to reflect on how much things have changed. The protocol that we can see with the most traction is MQTT. MQTT has evolved into the defacto standard for sending and receiving data streams. The proliferation of open source tools and wide adoption across the major cloud platform providers has cemented MQTT’s place in the IoT world. When streaming high velocity data to the cloud, it is important to resist the urge to use a RESTful based technique. The cost associated with creating and breaking down RESTful connections is too costly which means you can’t get the performance necessary to handle high velocity data. This makes MQTT the natural choice for the data plane. However, MQTT isn’t without its problems. The trickiest part of using MQTT is dealing with corporate firewalls because native MQTT runs on ports 1883 and 8883. To solve this problem, the Wind River Helix Device Cloud agent runs MQTT over encrypted WebSockets. This allows Device Cloud to use MQTT in a firewall friendly manner, even when deep packet inspection is in place.